In this paper a mathematical model for simulation of thermal fields from wells located in permafrost area is considered, which takes into account basic physical, technological, and climatic factors that lead to a nonlinear boundary condition on the surface of the soil. 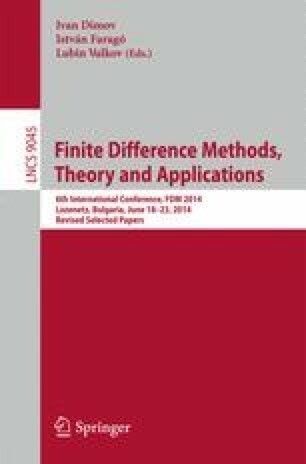 To find the thermal fields a finite-difference method is used to solve the problem of Stefan type, and solvability of the corresponding difference problem is proved. Possibilities of the developed software are presented to carry out various numerical experiments and make long-term forecasts in simulations of thermal fields in the system “well – permafrost” with annual cycle of thawing/freezing the upper layers of the soil due to seasonal temperature changes, intensity of solar radiation and technical parameters of the wells. Comparison of numerical and experimental data are in good agreement (difference is about 5 \(\%\)) due to, in particular, that the software adapts to the geographic location by using special iterative algorithm of determination of the parameters, included in the non-linear boundary condition on the soil surface. Supported by Programs of UD RAS “Arktika” and Program 15–16–1–10, and by Russian Foundation for Basic Research 13–01–00800.